Broward County, Florida, is in the southeastern portion of the “Sunshine” state. With a population of 1.936 million people, it is the second most populous county in the state of Florida, as well as the nation’s 15th most populous county. The county seat is Fort Lauderdale, a widely popular tourist destination known for its beaches, diversity and nightlife. With a large population and residents from all different backgrounds, there are various styles, designs, and decors incorporated in the houses and neighborhoods throughout Broward. As the heart of the home, the kitchen plays an important role. Kitchen remodels can be very expensive, but Artistic Refinishing offers kitchen countertop refinishing in Broward that helps make your kitchen countertops look as good as new at half the price! Your kitchen is an important part of the home and its overall functionality and appearance affect your home value. It is where countless memories are shared, including birthdays and anniversaries. It is where meals are shared, and where memories are made. You want to make sure your kitchen can serve its purpose and look good as well. The kitchen countertops play an integral role in your kitchen’s overall appearance and function. Broward kitchen countertop refinishing is an affordable way to give your kitchen desirable looks Your kitchen countertops are used repeatedly every single day. Countertops that become worn and tattered will also become more difficult to clean as they age. With Broward kitchen countertop refinishing from Artistic Refinishing, all the problems can be corrected at once. Show off your style and décor in your kitchen. Artistic Refinishing can take your kitchen into a much more functional phase with a more modern look when you entrust them with your Broward kitchen countertop refinishing needs. Our kitchen countertop refinishing results in a smooth, durable finish that is attractive. Our refinishing will leave a clean non-porous surface that is easy to clean. Non-porous surfaces are also healthier because they are easy to clear off bacteria. Artistic Refinishing uses a guaranteed coating system with first-rate success at a considerably reduced cost compared to kitchen remodeling services. Our kitchen countertop refinishing in Broward costs about half the cost of refacing countertops. With kitchen countertop refinishing in Broward, you can transform your kitchen within a matter of hours and limited inconvenience. This is the most affordable way to to make old kitchen countertops look new again. 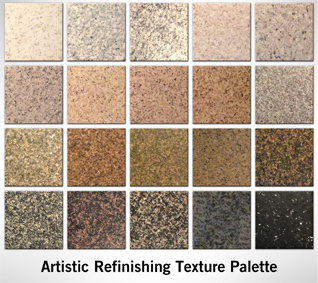 At Artistic Refinishing, our team has handled Broward kitchen countertop refinishing needs for countless clients. With more than 30 years of experience, as well as being licensed and insured, we are the premier choice for kitchen countertop refinishing in Broward. If you want a modern look in your Broward kitchen, call the experienced Broward kitchen countertop refinishing specialists at 954-300-3609 today for a free quote.